Vanderhorst Brothers Inc. performs milling, turning, EDM, programming and assembly services. 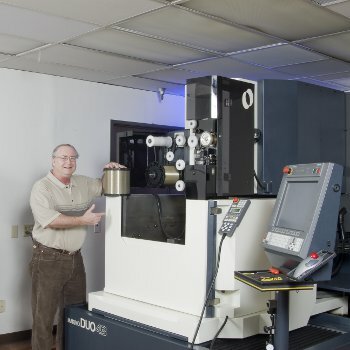 This mid-sized Simi Valley, Calif., machining company has been around for four decades, performing work for customers in the aerospace, medical, semiconductor and commercial industries. The company wanted to improve its wire EDM processes in order to eliminate its outsourcing and to reduce its consumables costs while increasing productivity. It was hoping to achieve these things without sacrificing speed or product quality. Vanderhorst Brothers had purchased a Makino EDGE2 sinker EDM machine several years earlier in order to bring high volumes of valve body operations that had been outsourced back in-house. The improved quality and lead-times that resulted from this equipment, as well as the favorable experience with the Makino sales engineer, led it to look at Makino machines again. This time, Vanderhorst Brothers obtained a Makino DUO43 wire EDM machine. The DUO43 wire EDM machine replaced two of the company’s previous wire EDM machines and maintained the same level of production. This new wire EDM tooling helped Vanderhorst Brothers not only save on the operational costs of running a second machine but also lower the maintenance costs and wire consumption. Wire consumption has been reduced significantly without compromising speed or quality. In fact, the company is saving as much as 50 percent in many applications, sometimes as much as $10,000 per year on wire costs alone. While the wire is released more slowly, it enables the machines to finish its jobs in fewer passes with less breakage. The reliability of the DUO43 machine means that a wide variety of applications can run unattended with little to no maintenance—something that was unheard of with Vanderhorst Brothers’ former wire EDM tooling. The reliability coupled with faster burn rates means cycle times have improved over the previous machines by as much as 30 percent. The machine’s reliability and large wire-spool capacity have enabled operators to manage other projects during the day while running for extra hours at night or on weekends, ultimately improving the cost per part.